Zachary Thomason has a rare illness that makes even breathing a challenge. But now, a robot bought by the Paragould School District will let him sit in class like other students. Zach has been diagnosed with X-linked Myotubular Myopathy, a condition associated with muscle weakness and decreased muscle mass. "He has very thin, weak bones and tiny little muscles and then the rest of the tiny little muscle, tiny little bone and then the fat around like on his arm or something, and it's so small," explains his mom, Tonya Thomason. His body is so weak, he can't eat or breath on his own. "In the first grade, he was able to attend school six visits, and he was welcomed by the children," she says. Since then, technology has changed. "Next year, we'll be able to participate on a daily basis and hit the core subjects," says Zach's mom. 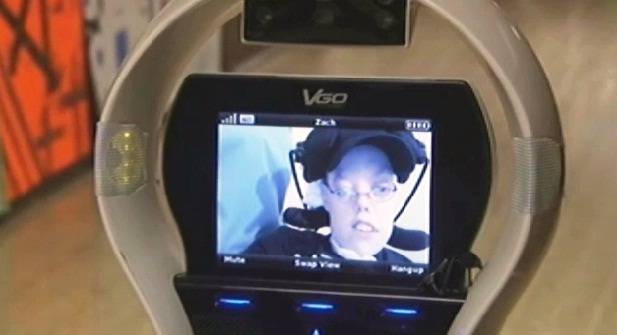 Zach is testing a VGo robot equipped with a camera and controlled on the computer. It will allow him to participate in class. "Zach got to sit in on a science project for the first time, and the speech path was over there with him and they actually had to turn down the volume because Zach wanted to keep interrupting the class because he was so excited about being there," says Special Education Director Kelly Colbert. She says a lot went into installing the robot and the addition should be a thrill. "It's so hard to turn the pages of a book. He cannot write. He can't do the math because he needs manipulatives to be able to work with. He can't hold his little fingers up to count," she explains. Although Zack will need help all his life, this robot, at least for a little while, can help him feel like everyone else. "He has all the little dreams and make believe and goals in his little world that everybody else does. he's just limited to his world." Zach is testing the robot every day for a few hours at a time.